On Monday The New Yorker’s Jane Mayer dropped a lengthy warning about the consequences of Mike Pence becoming President of the United States. Buried deep inside was a revealing nugget, recounting how two sources recalled Donald Trump “joking” that his number two man wanted to kill LGBT Americans. Despite the ribbing, Trump is said to have a good relationship with Pence — who, critically, is the only person in his orbit who he cannot fire. Pence, a former governor of Indiana, is known for his deep religious faith and hostility to LGBT rights. An avowed opponent of gay marriage, Pence’s most notable moment while leading Indiana was an entrenched battle over legislation that would allow businesses to discriminate against LGBT people for religious reasons. The Religious Freedom Restoration Act sparked an immediate firestorm, forcing Pence and the legislature to water it down. “There have been other evangelical Christians in the White House, including Carter and George W. Bush, but Pence’s fundamentalism exceeds theirs,” warned Mayer, who said that if Pence ever took the top spot, he would be far more effective than Trump in advancing the GOP agenda. 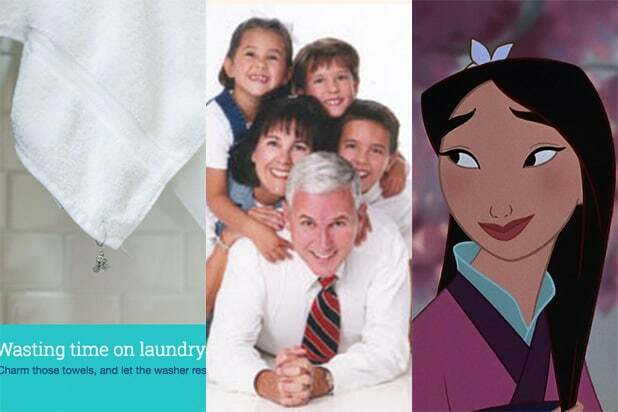 From dubbing Disney movie "Mulan" as liberal propaganda to saying smoking doesn't kill, here are a few things that Mike Pence has done or said that's got us confused. Pence wrote an op-ed in 1999 decrying Disney's "Mulan" as the propaganda of a "mischievous liberal" aimed at supporting women in the military. "Many young men find many young women to be attractive sexually. Many young women find many young men to be attractive sexually. Put them together, in close quarters, for long periods of time, and things will get interesting," he bizarrely claimed. "Just like they eventually did for young Mulan. Moral of story: women in military, bad idea." Ever been frustrated when you just can't figure out which bath towel is yours? Don't fear, Mike Pence's wife, Karen, has your back with her towel charms, which promise to solve all of your towel-induced woes. Since Pence was introduced as Trump's VP, however, the business has been "on hold," according to its website. That's My Towel Charm Inc.
Pence tried to launch a state-run news organization called "Just IN" that would only publish content written by Indiana's state communications office. Luckily it never came to fruition due to heavy backlash, but had it gone live, the outlet would have been funded by taxpayers. There are a couple of things that people found fault with Pence's July 16 tweet: First of all, there is no Chili's restaurant in Manhattan. The closest are in New Jersey, Staten Island or Queens. Second, where is his daughter's reflection in the mirror? The Internet naturally concluded that she must be a vampire. Pence penned a number of columns in the '90s, such as a piece on why the Titanic is a metaphor for modern America. "Like the passengers of the Titanic who gave no thought to the strength of the Irishmen who built their vessel at the Harland & Wolf shipyards in Belfast, so do we give no thought to the virtues of those who built our ship of state. And we, like they, do so at our peril." Pence also apparently thought that smoking doesn't kill. "Despite the hysteria from the political class and the media, smoking doesn’t kill," he wrote. "Those of you who find the tobacco deal acceptable should be warned as you sit, reading this magazine, sipping a cup of hot coffee with a hamburger on your mind for lunch. A government big enough to go after smokers is big enough to go after you."